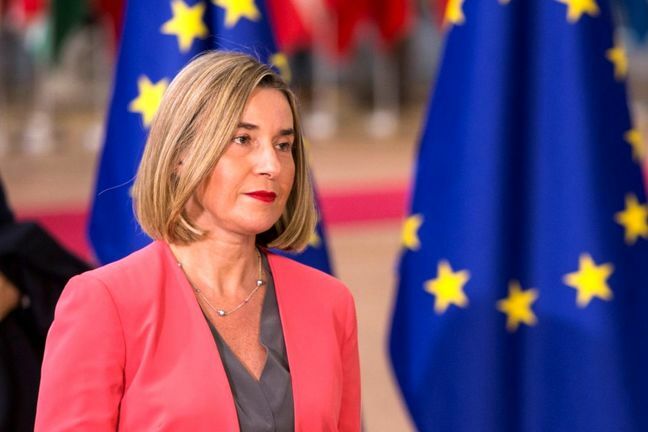 EghtesadOnline: The European Union’s foreign policy chief said on Monday a system to facilitate non-dollar trade with Iran and circumvent US sanctions could be in place by the yearend. The European Union wants the Special Purpose Vehicle to help preserve the economic benefits for Iran deriving from the curbs it placed on its nuclear program under a 2015 deal with world powers, from which US President Donald Trump withdrew the United States in May, Reuters reported. EU diplomats had hoped to have the SPV in place by now but ran into delays, as member states balked at hosting it for fear of being targeted by the revived US sanctions regime against Iran. According to Financial Tribune, she did not offer any other details following a meeting of the bloc’s foreign ministers in Brussels, but said work on creating the mechanism was “advancing well”. France and Germany are now due to take joint responsibility for the SPV. But EU diplomats have said its ambitions could be scaled back to encompass only less sensitive items such as humanitarian and food products, rather than oil trade. French Foreign Minister Jean-Yves Le Drian told the bloc’s ministers in a closed-door meeting in Brussels on Nov. 19 that Paris and Berlin were working closely together to achieve something by yearend, two other EU diplomats said. Mogherini's remarks were echoed by the head of the Atomic Energy Organization of Iran, Ali Akbar Salehi, one of the top nuclear negotiators of the 2015 Joint Comprehensive Plan of Action last week. "For some time, the Europeans have been committed to helping Iran compensate for the damages it has incurred as a result of the JCPOA and to create a mechanism so that Iran can benefit from the economic conditions of the JCPOA,” he said. Salehi noted that since creating a consensus between 27 members of the European Union is not easy, the Europeans have stated that they will make full efforts into completing this. “Based on the promises the Europeans have given, by the end of the current year, the European package will become operational,” he said. Salehi said one of the ideas being discussed is for Europe to buy all of its oil in euros rather than dollars. According to Salehi, Europe spends €300 billion to buy oil and was purchasing 85% of this figure in dollars. Iran’s Foreign Minister Mohammad Javad Zarif made similar comments about the SPV to Iranian reporters on Dec. 4, saying that the final arrangements for the SPV are being made, but have been kept confidential in order to prevent US attempts to thwart their efforts. Since Trump took office, he threatened to pull out of the nuclear deal signed by Iran with the European Union and five permanent members of the United Nations Security Council plus Germany, which caused a number of European banks and businesses to reassess business ties with Iran. As part of the deal, Iran reduced its nuclear capabilities in exchange for sanctions relief. The US officially pulled out of the nuclear deal in May, and the US Treasury has vowed to sanction any country doing business with Iran, though so far they have given some temporary exemptions to a few countries. Europeans who have opposed Trump’s decision to pull out of JCPOA have been attempting to establish an SPV to continue trade with Iran in hopes that Iran will remain in the nuclear deal while continuing to receive the economic benefits of the deal. Until now, the EU has been straining to uphold the nuclear accord, but has been less willing to consider sanctions and instead sought fresh talks with the Islamic Republic. Iran has warned it could ditch the nuclear deal, if EU powers do not protect its trade and financial benefits. A top Iranian diplomat warned last month Iran’s political and financial interests at present lie in remaining in the 2015 nuclear pact, but the adherence will definitely not be sustainable if the European Union continues to vacillate over its strategies to salvage the deal. Deputy Foreign Minister Abbas Araqchi appreciated Europe’s full political support for the deal over the past six months, but complained that “this period has not been too short for coming up with practical solutions”. Speaking at a conference on regional developments and international order in Tehran, Araqchi emphasized that for Iran, it does not make a difference whether Europe is unwilling to take a measure, is playing games or is willing but unable to deliver on pledges, since the result would be the same. “We will stick to JCPOA so long as it is in our interest, otherwise adhering to it would be pointless,” he was quoted as saying by ISNA. The SPV was conceived as a clearinghouse that could be used to help match Iranian oil and gas exports against the purchase of EU goods, circumventing US sanctions based on the global use of the dollar for oil sales. Araqchi also pointed to the consequences that Europe will have to face with the collapse of JCPOA. “If Europeans give in [to US pressure], their sovereignty, authority and security will come into question,” he said.